Monks Mound, the largest prehistoric monument north of Mexico, is also the largest-in-volume prehistoric earthen construction in the Americas. Monks Mound is one of 69 remaining mounds at Cahokia, most inside the 2,200 acre park preserving the central section of the largest prehistoric city north of Mexico and the largest ancient settlment in North America in its time. Monks Mound may have been positioned with a predetermined geodetic attribute, the latitude tangent equals 0.80 (Monks Mound's geodetic axis is the hypotenuse of a 4:5 triangle). 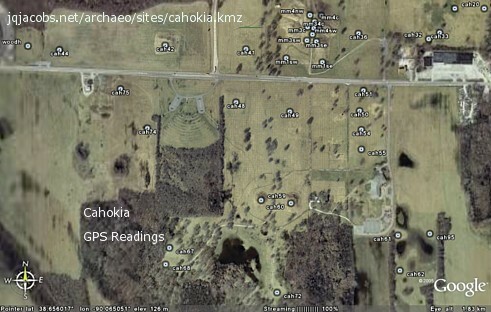 Considering why sites may have been positioned where they're situated arose in relation to Cahokia after an author attributed Cahokia's placement to the nearby 60 degree solstice angle. 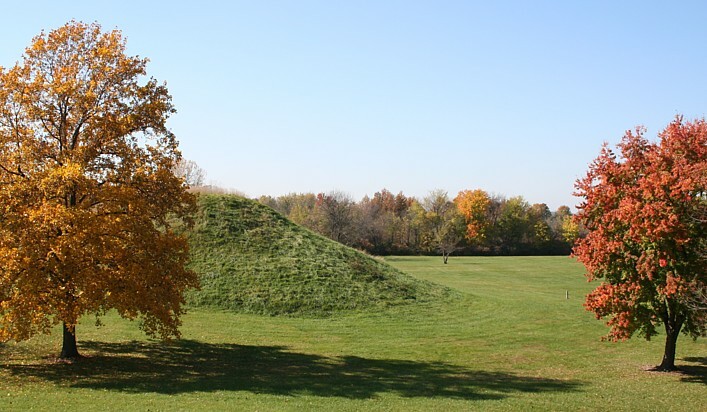 The hypothesis gained acceptance uncritically and Cahokia was even termed, "The City of the Sun." While considering this idea, to quantify the temporal change in illumination angle, I assessed the geodetic properties of the Monks Mound latitude and discovered the '4/5 atan' latitude instead. I also determined the solstice angle hypothesis was not accurate. The latitude where tangent equals precisely 0.80 is 38.65981 degrees. Today atop Monks Mound the latitude, GPS mean of four corner readings of upper terraces, equals 38.66052 degrees N. (tan = 0.800020). Given the formula for secular polar motion, I deduced the monument was positioned where latitude tangent equals precisely 0.80 around 1200 AD. This date is close to the radiocarbon date of the last constructs on the mound—the radiocarbon date and the polar motion dating agree. Current local plate motion modeling methods suggest less north-south motion. 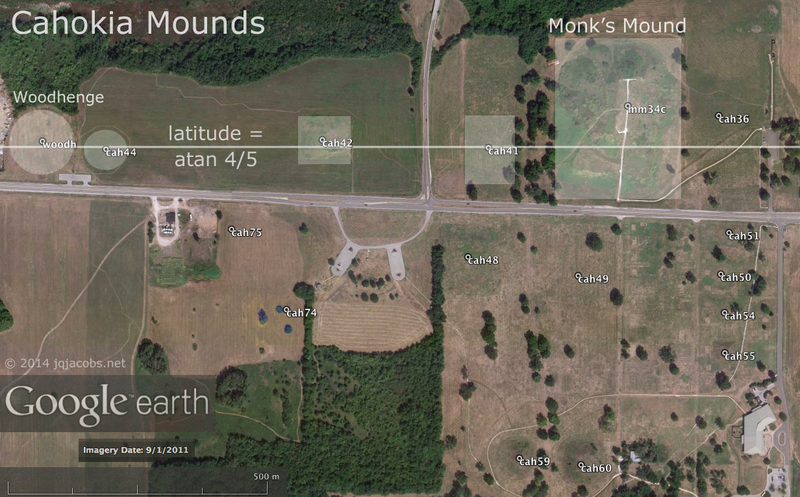 The current atan 4/5 latitude transects Woodhenge, matches the primary baseline of E-W mounds, and transects Monks Mound in front of the upper terrace (see two images following). Tectonic plate motion and polar motion alter the actual latitude of almost all geodetic positions on the planet, very slowly altering the latitude of positions at a local rate. The change in latitude due to plate and polar motion is very slow compared to the temporal change in solar and lunar illumination angles, a trigonometric function of latitude related to the angle of inclination of the axis of rotation (obliquity to the ecliptic). These temporal changes provide possible date-reaching mechanisms. Monks Mound illustrates the possible utility of site latitude both as evidence of geodetic knowledge and as a date-reaching method. 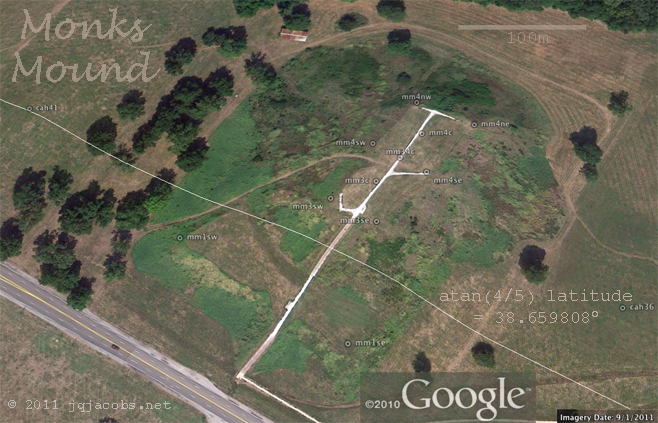 The baseline of monuments at Cahokia is precisely the atan 4/5 latitude. The possibility that solar illumination geometry was the reason for Monks Mound's placement, contrastingly, is a very imprecise match at best. 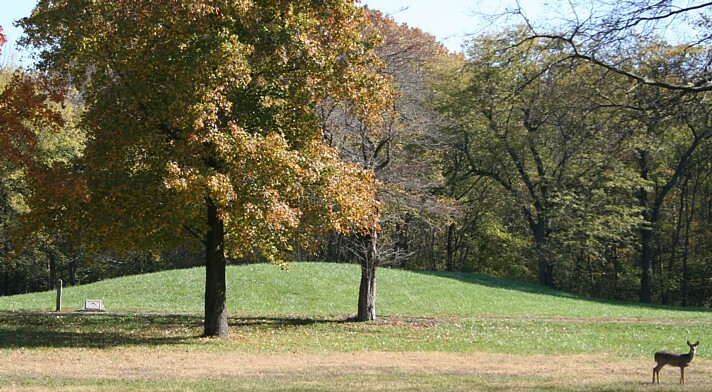 And the displaced position of the Woodhenge center post (discussed below) indicates the builders understood that the local solstice swing was greater than 60 degrees. The latitude where the solstice angle equals 60 degrees is south of Cahokia, and was moreso earlier in time. As earth's obliquity angle changes, the latitude at which the solstice angle equals 60 degrees moves about 150 feet a year and was much further south during the prehistoric period. 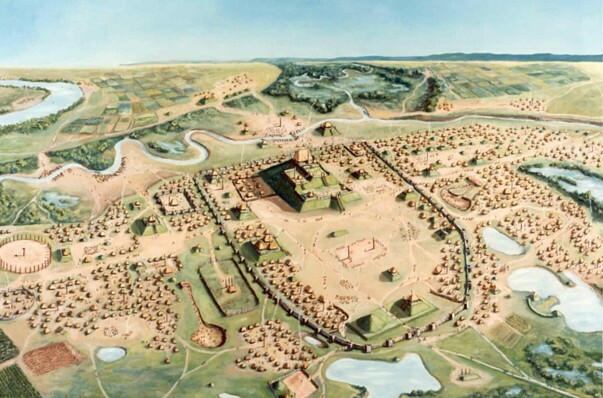 Cahokia Mounds State Historic Site, painting by William R. Iseminger. Woodhenge, a 125 m circle of evenly-spaced and cardinally-aligned posts, evidences an alignment to solstice sunrises with displacement of the center post. At the latitude of Cahokia, the solstice azimuth spans near 1/6th of circumference; the precise latitude of this coincidence is south of Cahokia. Woodhenge's center post is displaced eastward so the two posts at 30 degrees north and south of due east align to a wider angle than centerpoint angles, to the winter and summer solstice sunrises. Warren Wittrey wrote articles in The Cahokian after discovering the even-spacing and circularity of the large Woodhenge pattern and doing further excavations and research. Study of post moulds in this area west of Monks Mound revealed five successive circles or partial circles build beginning around 1100 CE. 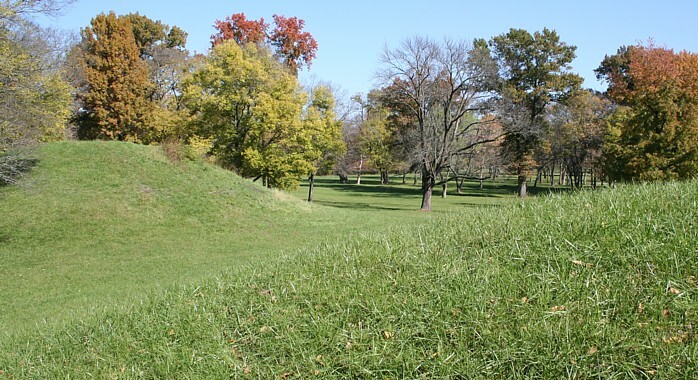 The south face of Monks Mound. Looking north across the plaza to Monks Mound. Looking east towards Monks Mound from Woodhenge. The Interpretive Center. 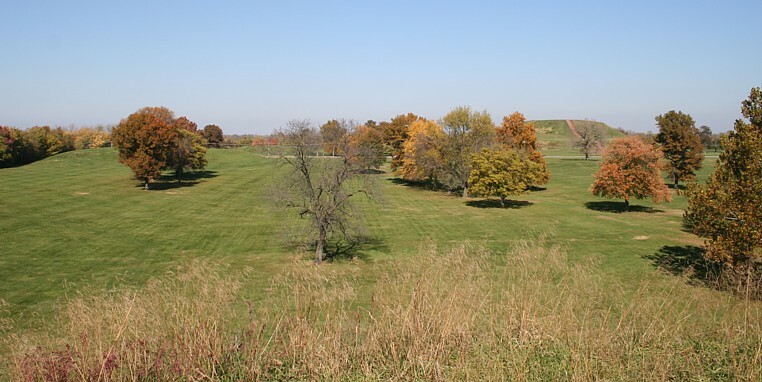 Cahokia Mounds State Historic Site, National Historic Landmark, and World Heritage Site. Cahokia Mounds Google Earth placemarks file has all GPS readings. and leading authority on the Cahokia civilization, for permission to use his painting of ancient Cahokia.